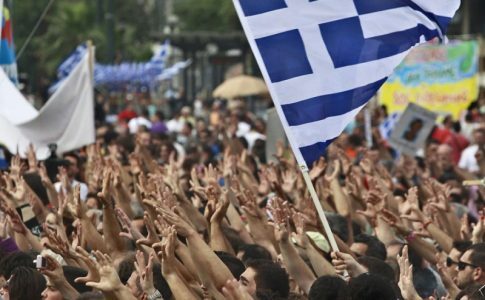 On August 6, we interviewed Kostas Skordoulis and Yanis Felekis, leading members of the group OKDE-Spartakos and founding members of the Institute for Political and Social Research Center Pantelis Pouliopoulos (IPSR Pouliopoulos). After a two-hour journey by bus we arrived at Kamena-Vourla, a seaside resort in the center of Greece. In the past, this small coastal village was a very popular holiday getaway for the working class. A camping site located about 10 km from Kamela-Vourla was the venue for the summer camp organised by OKDE-Spartakos. They invited us to attend the 4-day event. Very soon after our arrival we had a very interesting conversation with Kostas and Yanis. They told us about the founding of the Institute Pantelis Pouliopoulos, the name being a homage to the founder of Greek Trotskyism, and shared the story of this important project with us and Left Voice readers. Left Voice: Why and when was the Institute for Political and Social Research Pantelis Pouliopoulos created? Kostas: It was created at the beginning of 2014, to serve three purposes: the first one is to do historiographical work and research, that means to save the archives concerning the very old history of Greek Trotskyism, digitalise the archives and also to classify them so that they are available to the new generation of historians of the workers’ movement in Greece. The second aim is to organise educational seminars on very hot topics of Marxist theory for the education of younger comrades. And the third purpose is to initiate research on current topics for Marxist theory. In fact, not Marxist theory in general, but for Trotskyism, revolutionary Marxism and how revolutionary Marxism relates to new questions, the current questions that the class struggle makes us ask ourselves. There are different groups of political research in Marxist theory but the perspective from which they take on current questions is mainly from the points of view of Critical theory, the Frankfurt School, Left Eurocommunism, and so on. We feel the need to analyse the current situation so as to give new answers to current problems, but from a revolutionary perspective. 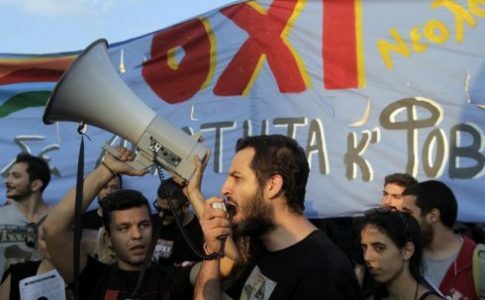 Yanis: Another necessity is due to the fact that many topics for the Greek left are ‘closed books’ or ‘non-existent’; for example, the German revolution, revolutions, were never discussed in the Greek left, self-management, which is a word that is ‘unknown’, they have never heard of it. For Stalinism, Eurocomunism, Maoism, these words are out of their scope, they never heard about these topics. When they say soviet they mean Russia, they don’t understand the meaning of the word soviet. LV: Why is the Institute called Pantelis Pouliopoulos? Kostas: The Institute is called Pantelis Pouliopoulos because he is the most prominent Marxist figure in Greece; he is also the founder of Greek Trotskyism, of our political current. Yanis: He became Trotskyist at the same time that Trotsky was outlawed for what he said about the Soviet Union. He was not in contact with Trotsky so he didn’t know Trotsky’s views. Pouliopoulos was expelled from the Greek Communist Party, when a group came back from Moscow and Zachariadis, the next leader of the Greek Communist Party for the next 40 years, came back appointed by Moscow and expelled the entire leadership. The old leadership was expelled. 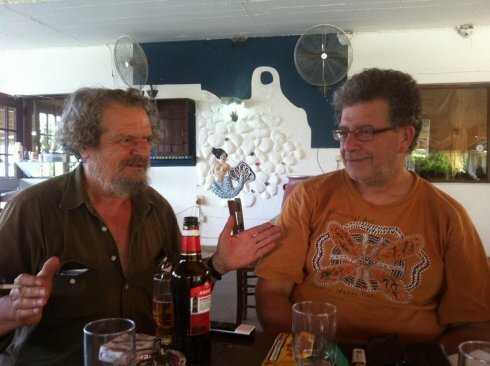 LV: And Pouliopoulos was not in contact with Trotsky? Yanis: That’s right. Pouliopoulos was not in contact with Trotsky. In Greece it was not like what happened with James Cannon in United States, when Cannon found the documents of the congress of the International by accident. Pouliopoulos found that his opinion was the same as Trotsky’s on internationalism, internal democracy and also about the revolution many years later – 23 years later. LV: You have told us that Pouliopoulos was an important figure of Greek Marxism and Trotskyism. How did the end of his life play out? What happened to Pantelis Pouliopoulos? Kostas: In fact, Pouliopoulos was in prison during the Metaxas dictatorship in 1936, when he was arrested. When the Greek state collapsed after Nazi Germany entered the country, the Stalinists who were in control of the prisons handed the prisoners over to the Germans. Yanis: This was two months before the invasion of Russia, so they collaborated with the Nazis. Yanis: among them leaders of the Communist Party and also four or five Trotskyists, and they all were executed. Kostas: They were executed in 1943 as retaliation for a guerrilla action that took place in Central Greece. In fact, the place actually of the execution is not very far from where we are here now. Yanis: Pouliopoulos was a very intelligent person, he spoke almost all the languages of Central Europe and also Turkish. He spoke to the Italian firing squad. Kostas: Pouliopoulos addressed the Italian firing squad in Italian saying ‘you are workers also’ and explained the nature of the imperialist war and so on. And the firing squad refused to shoot him, so an officer had to execute him. And after him then all the prisoners were executed. LV: Coming back to the present. In which projects or activities are you currently involved? Yanis: In this work, he argues against Stalin’s Popular Front and defends the theory of Permanent revolution against the Popular Front, etc. Kostas: We organised a 2-day Conference, with speakers who were not only Trotskyists but also left-wing academics, because we didn’t want to limit our work only to Trotskyist intellectuals, we wanted to involve other left-wing intellectuals. We want to build a broad circle of academia to work with the Institute. We also are planning another conference for 2016, to commemorate the 20th anniversary of the death of Michel Pablo, who you know was a very prominent figure for world Trotskyism. Our organisation as it stands out today, has differences with Pablism politics, but nevertheless, Pablo was very important for world Trotskyism and we want to have a critical appraisal of his work and his theoretical stanzas. At the same time our main concern is to save archives, so we are trying to design a programme to not only save those from our organisation that go back to the 50’s and 60’s, but also to collect archives from individuals, individual Trotskyists of all generations, etc. Our main problem, of course, is financial, to find a place to house the archives so they are safe. So, we are facing these problems. LV: Does the Centre hold unique documents? Kostas: We have a lot of unique documents from the 40s, we also have lots of documents from the 50s and we also have documents from other world Trotskyist movements because there were exchanges with other organizations in the 70s and the 80s. We think that in some sense these archives are unique and we want to safeguard and to open them up to research by younger historians. We have a publishing house called Vanguard Library, and it has its own independent activity. We want to link the work of the publishing house with the work that we are doing in the Institute. In fact, the publishing house has a long history; it was created in the 50s. We have an Internet site where we have a list of all our publications, the books that we have published so far. LV: Finally, why do you think that the work carried out by the IPSR is relevant nowadays, both for new generations and for the revolutionary movement? Kostas: We have to combat postmodernist ideas, which are very popular in academia internationally. 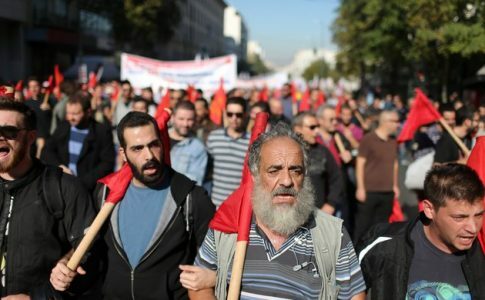 In Greece in particular the dominant Marxism is close to left Eurocommunism. Yanis: Yes, Poulantzas, Althusser and Berlinguer… For example, for Syriza, the main figure is Berlinguer. Kostas: We want to revive research in revolutionary Marxism as I said before. Personally, and for many of us, Ernest Mandel was a key revolutionary figure for revolutionary Marxism. After the death of Ernest Mandel what we called the revolutionary Marxist perspective declined, even the Fourth International declined. So we want to spark research from a revolutionary perspective.